Momma Jorje: Do you love Halloween? Sasha "helped" me assemble our ghost yesterday. It was pretty fun to put together! Daddy helped me name our ghost (Bradley Boo). Then I decided I really had to get out there immediately! No more procrastinating. I don't usually go out after dark, but the head of the ghost blinks. You gotta do it after dark! I was getting giddy at the idea of it! As soon as Sasha was in bed, I grabbed Spencer and headed out the door (leaving my teen and Daddy home, too - no worries). I could not stop grinning the entire drive! I absolutely got an adrenaline rush as I headed to my friend's house! Its like doing something sneaky... in the dark... but kind! How crazy! This was so much more fun than I even thought it would be! I had made sure her husband wasn't away on business, as I didn't want to scare anyone by knocking on their door after dark, unannounced. I parked my van, dimmed my lights and snuck up to the well-lit porch. I really wanted to hang Bradley in a spot you could see from the door, but was also trying to be quick. I wound up hanging him on the handle, just like they show in the packaging. I knocked ever-so-gently, so as not to risk disturbing any little ones that might be working on bedtime. And then... I sprinted back to my van! It was hilarious! But no one opened the door. I texted my friend, "Psst. Was that a knock at your door?" This still makes me laugh! Her husband had looked out the door, but not seen anyone! I advised they should open the door and check. Meanwhile, I had backed up one house down the road and had my lights all turned off, stalker-style. 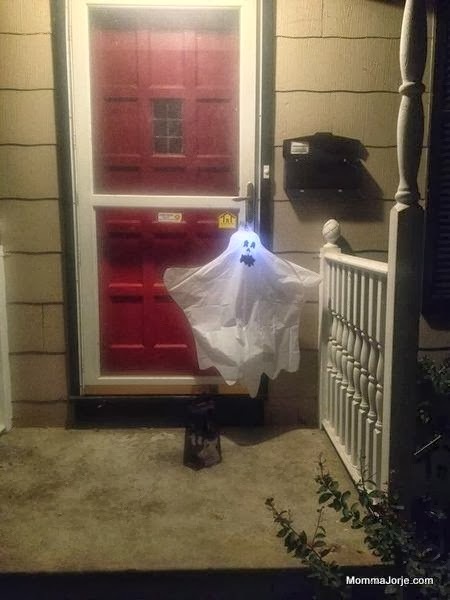 I wanted to make sure that they didn't get the ghost but miss the goodie bag or whatever. Maybe I fret too much. She didn't miss a thing! Knowing my friend (and her husband) were fans of Halloween, they were a perfect choice for our first haunting! I prefer the term haunting, but can see why the company chose a less frightening term. This is a very family-friendly activity. I love the idea of having invitation delivery be your ghost's mission. (You get to define your mission.) I just offered a bag of candy plus the door tags included. 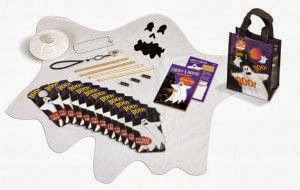 The kit provides a booklet where you can write in the list of people to haunt. My friend is looking forward to doing her own ghosting tonight! But wait, I spend this money and then don't get to keep anything? Actually, the booklet asks the last person ghosted to please return the ghost, bag and tracking tag to the original ghoster! This would be especially convenient if the game involved invitations, then the kit could be returned at the party. You can print new lists online, so you could absolutely reuse the kit again each year! White ghosts are people on my list not "ghosted" yet. The orange-ish ghost is my first victim. Oh! And did I forget?! This comes from a company that makes GPS units! This is a geocaching-related product. So when your friends get online and track where the ghost has been, you get an email notice that they have the ghost - complete with map! This product is actually ON SALE right now through the website! You can purchase your own kit for $16.95. You can also find one locally. 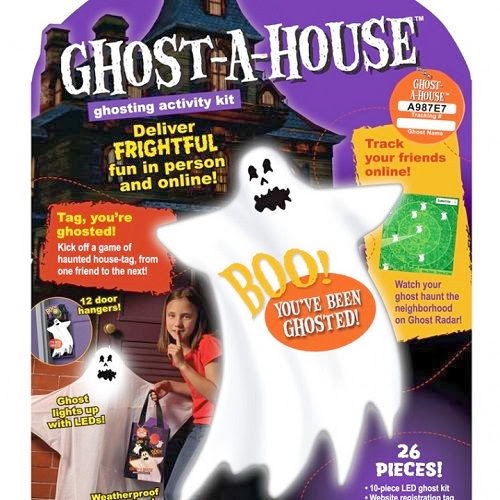 Disclosure: I received Ghost-a-House for review, free of charge.